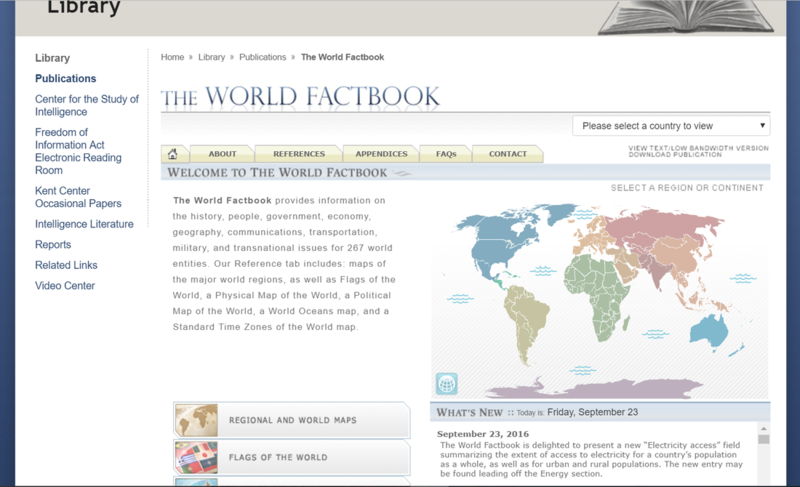 The World Fact book gives a multitude of information about history, people, government, economy, geography, communications, transportation, military, and even transnational issues. This resource is free and a log in is not required to view the facts and information. The authority and validity of this source seems extremely acceptable considering it is provided by the CIA. The information provided is current to each year. The tabs available for use on this website include: maps of different parts of the world and flags of the world. The maps are political, physical, ocean maps, and time zone maps of the world. This is a surplus of information for students to use while researching a country. This is a great resource for teachers to use to teach from as well as for students to use when researching. Students could research about a region and then create a project to present and use to teach their peers. 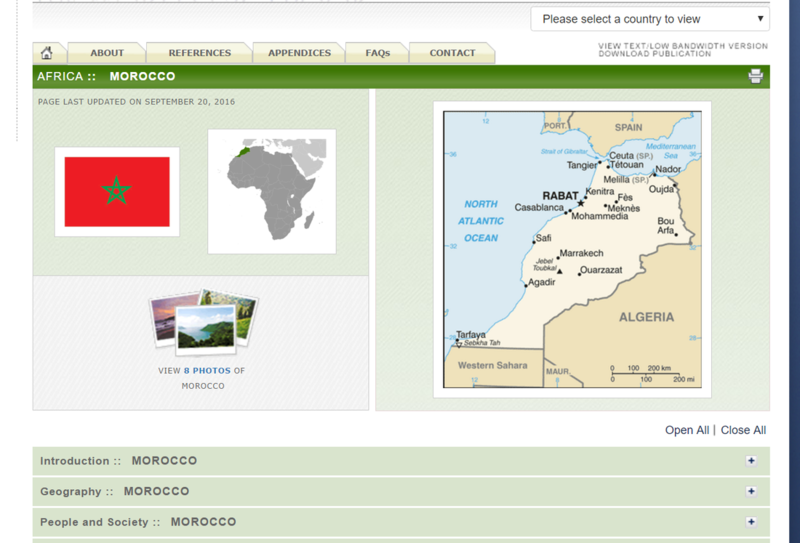 I selected Morocco to investigate this website further. 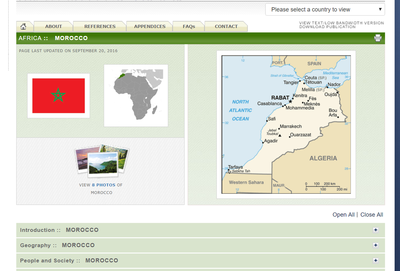 When you select a county you can view the flag and photos of the country. A map is also visible with major cities labeled, nearby lands and waterways. Students requiring information about history, geography, government, economy, energy, communications, transportation, military and transnational issues would find great use of this website. 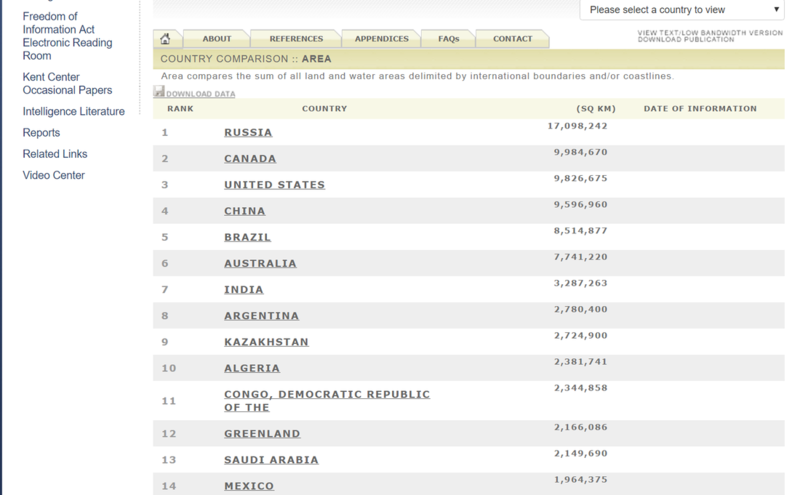 This is a great resource for finding information about countries and geography. 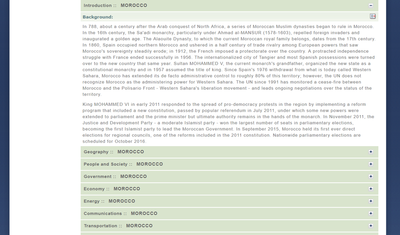 Using this resource, I found out that in 2015, Morocco held its first ever direct elections and nationwide elections are scheduled for 2016. I’ve also learned that Morocco is three times the size of New York and slightly larger than California. 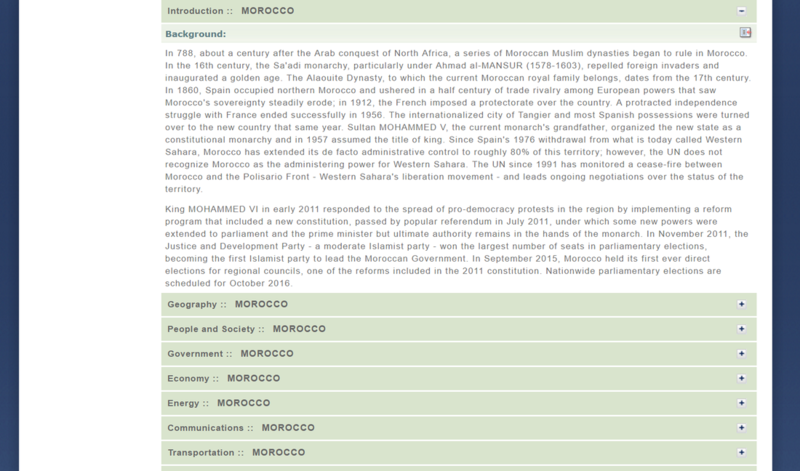 The official language in Morocco is Arabic. There is a tab of titled references on this website. This tab has a World Factbook User’s Guide. I found the guide to country comparison incredibly engaging. 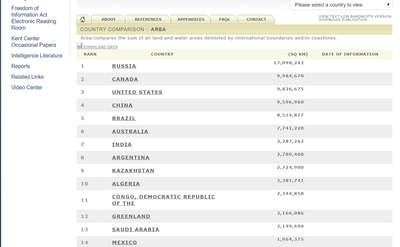 You can compare country size, people and society, economy, energy, communications, transportation and military. I selected to compare country sizes and found that the United States in smaller than Canada, but slightly larger than China. This website has so much information and facts to offer that I find it a bit overwhelming and would require a high level of reading comprehension to use the website sufficiently. I would suggest using this resource with middle or high school students.